Bill Gates - Chairman and Chief Software Architect (1975-2008) at Microsoft, U.S.A.
Bill Gates an icon of software industry, incredible genius ideologist, world class entrepreneur and a well-known philanthropist of USA; with high ambition, enthusiasm and passion in computer programming, took the reins of Microsoft as Chairman and Chief Software Architect in 1975, and successfully led the company until 28 June 2008. He continues to serve as Chairman of Microsoft and an advisor on key development projects, with successors Ray Ozzie as Chief Software Architect from 2006 and Craig Mundie as Chief Research and Strategy Officer. He reduced his responsibilities and decided to spend more time at the Bill and Melinda Gates foundation, found by Bill and his wife Melinda in January 2005 with endowment of more than $28.8 billion, to support philanthropic initiatives in the areas of global health, education and learning. Bill by nature was a curious learner and was a voracious reader; this zeal made him to write computer programs at a very tender age of 13yrs. His mind was a book of ideas in which the content of any two pages was not similar; it was always new and creative. These interests made him invent breakthrough technologies and through efficient long-lived strategies, perfect vision, high spirit of innovation and aggressive competitive tactics; he built and headed the dominant software global leader Microsoft Corporation; a blend of "micro-computer" and "software". After more than three decades of strong leadership of Gates, Microsoft Corporation developed and transformed into world’s largest software American public Multinational Corporation headquartered in Redmond, Washington, USA .The company develops, manufactures, licenses, and supports a wide range of products and services exclusively related to computing through its various product divisions. This helps people and businesses to give out their full potential. Microsoft employs a huge workforce of around 90,000 worldwide out of which 30,000 are programmers, working in 105 regions and countries. The engineers of operating groups are valued more in Microsoft and are involved in all major decisions. The net worth of Microsoft as of 2011 accounted to 59bn dollars. Today there is no irony in saying that Microsoft is more recognized and influential brand in the computer industry serving the needs of people all over the world, with every desktop computer using at least one software program from Microsoft. With out Bill Gates Microsoft was not possible and without Microsoft, computer industry would not have flourished as it is today. Therefore, Bill Gates was the first person to revolutionize and redefine computer world of technology, by developing killing software programs. He was strongly driven by a belief that personal computing would be indispensable and valuable tool in every office and home desktops, in the future ahead. His name is inseparably attached to the world of software technology (especially Microsoft); as he put forth all his energies and capabilities to advance and continuously upgrade software technology making it easy to use, cost effective and enjoyable to all the users. He marked a beginning of new digital era and became an inspiration for many software enthusiasts and professionals. Gates strived through many controversies from many people including late Steve Jobs of Apple Inc, that Bill had aggressive and unfair business practices and monopoly, for which he often had to fight legal battles. Nevertheless, as a man of consistency and patience, he took the criticism in positive and constructive manner and used it as greatest source of learning, because of which he wrote world’s best software programs and stood an unbeatable business icon of 21st century. 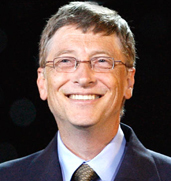 Bill Gates stood as world’s wealthiest man for 17 consecutive years until 2010. In 2011 he was 2nd, because his philanthropic ideas pushed him to second place. Bill Gates started computer programming at a very young age of thirteen. Both the friends Bill Gates and Paul Allen succeeded in running a small company called Traf-O-Data and sold a computer to the city of Seattle that could count city traffic, proving their abilities in software programming at a very young age. After dropping out from Harvard, both Gates and his high school (Lakeside School) pal Paul Allen, who shared common interest of computer programming were all set to start a company called Microsoft , a unique combination of "micro-computer" and "software", in 1975. This was the beginning of a great history of computer revolution and the saga of Microsoft flourished, evolved and continued until date. Today every computer desktop in the offices and homes use at least one Microsoft program. Career of Gates took a great kick start by programming a BASIC interpreter for the microcomputer issued in January 1975, by popular Electronics featured Micro Instrumentation and Telemetry System’s (MITS) Altair 8800, along with his childhood friend Paul Allen. Both the master brains in computers, first tested the interpreter on a simulator and not the actual device, but the interpreter worked without any problems to MITS in Albuquerque, New Mexico in March 1975; MITS agreed to distribute it, marketing it as Altair BASIC. Microsoft was officially established on April 4, 1975, with Gates taking charge as CEO. In August 1977, Microsoft formed an agreement with ASCII Magazine and established its first international office “ASCII Microsoft", in Japan. In 1979, the company shifted to a new home in Bellevue, Washington. Microsoft entered the OS business in 1980 with its own version of UNIX, called XENIX. The success story of Microsoft began in 1981with the MS-DOS computer operating system that Gates licensed to IBM; this made use of computers much easier. Gates was very aggressive in protecting the royalties he acquired from computer software against all sorts of piracy and effectively created retail software market that exists today, which brought huge commercial success to Microsoft. It is MS-DOS, that strengthened the company’s dominance and Microsoft became leading PC OS vendor. In 1983, Microsoft entered and expanded its footage into new markets with the release of Microsoft mouse in 1983 and a publishing division named Microsoft press. Paul Allen resigned from Microsoft in February after developing Hodgkin's disease. In 1985(OS/2 was jointly developed with IBM), Microsoft released Microsoft Windows, a graphical extension for MS-DOS, on November 20. Microsoft moved its headquarters to Redmond on February 26, 1986, and on March 13, the company went public. Microsoft announced the release of its version of OS/2 to original equipment manufacturers (OEMs) on April 2, 1987. Meanwhile, the company was at work on a 32-bit OS, Microsoft Windows NT, using ideas from OS/2; it shipped on July 21, 1993 with a new modular kernel and the Win32 application-programming interface (API), making porting from 16-bit (MS-DOS-based) Windows easier. Once Microsoft informed IBM of NT, the OS/2 partnership deteriorated. Microsoft introduced its office suite, Microsoft Office, in 1990. The software unified separate office productivity applications, such as Microsoft Word and Microsoft Excel. On May 22, Microsoft launched Windows 3.0 with a streamlined user interface graphics and improved protected mode capability for the Intel 386 processor. Both Office and Windows became dominant in their respective areas. In 1995, Microsoft was at verge of extending its product line due to “Internet Tidal Wave memo”. The company released Windows 95 on August 24, 1995, featuring pre-emptive multitasking, a completely new user interface with a novel start button, and 32-bit compatibility; similar to NT, it provided the Win32 API. Windows 95 came bundled with the online service MSN, and for OEMs Internet Explorer, a web browser. Internet Explorer was not bundled with the retail Windows 95 boxes because the boxes were printed before the team finished the web browser, and instead was included in the Windows 95 Plus! pack. Extending out into new markets in 1996, Microsoft and NBC Universal created a new 24/7 cable news station, MSNBC. Microsoft created Windows CE 1.0, a new OS designed for devices with low memory and other constraints, such as personal digital assistants. Bill Gates handed over the CEO position on January 13, 2000 to Steve Ballmer, an old college friend of Gates and employee of the company since 1980, creating a new position for himself as Chief Software Architect. Various companies including Microsoft formed the Trusted Computing Platform Alliance in October 1999 to, among other things, increase security and protect intellectual property through identifying changes in hardware and software. October 25, 2001 Microsoft released Windows XP, unifying the mainstream and NT lines under the NT code base. The company released the Xbox later that year, entering the game console market dominated by Sony and Nintendo. Windows Vista the next version of windows was unveiled in 2007; mainly focused on features, security, and a redesigned user interface dubbed Aero. Microsoft Office 2007, released at the same time, featured a "Ribbon" user interface, which was a significant from its predecessors. Relatively strong sales of both titles helped to produce a record profit in 2007. Bill Gates retired from his role as Chief Software Architect on June 27, 2008, but continued in positions related to the company in addition to being an advisor for the company on key projects. October 27, 2008, the company entered into cloud computing platform for windows, through Azure Services Platform. On February 12, 2009, Microsoft announced its intent to open a chain of Microsoft-branded retail stores. Windows 7's focus was on refining Vista with ease of use features and performance enhancements, rather than a large reworking of Windows. Born: 2William Henry Gates III October 28, 1955 (age 56) Seattle, Washington, U.S.
Melinda Gates Foundation, Director of Berkshire Hathaway, CEO of Cascade Investment. William Henry Gates III was born in Seattle, Washington, on October 28, 1955. He was grown up in a well to do, warm and closely-knit family with two sisters Kristianne and Libby. The family atmosphere he grew was full of liveliness, high spirit and the children were always encouraged to be competitive and try to achieve excellence in whatever they did. His father, William H. Gates II, was an attorney at Seattle. Bill had a very intimate relationship with his mother; Mary was a regent from University of Washington, who devoted most of her time in bringing up her kids after her short-term career as a schoolteacher and working on civic affairs and charity programs. She also served on several corporate boards, among them First the United way (interstate bank of Seattle found by her grand father), and International Business Machines (IBM). Bill often accompanied her volunteer work in schools and community organizations. Bill spend most of his childhood in Seattle, Washington. Bill was altogether a different child from others. He was a voracious reader and spent countless number of hours in reading reference books like encyclopedia. He was doing well at school, but at times, he seemed bored and withdrawn. This became matter of concern to his parents and they were annoyed that he would become a loner. This made them to enroll young Bill in Seattle’s Lakeside School, an exclusive preparatory school, at the age of 13. 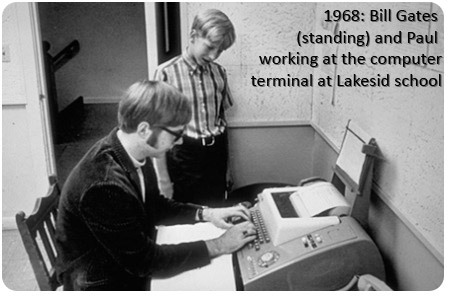 This decision was a turning point of Bills life, as he developed passion in computer programming during his stance at the Lakeside School. Bill opened up, did well in all his subjects, and was extremely good at Math and Science. He had an interest and did well in drama and English. It is in the Lakeside School that Bill became closer to his 2yr senior Paul Allen. Both of them shared their common interest in computer programming. They were quite different in nature, Allen was more reserved and shy and Bill was feisty and at times combative. After graduating from Lakeside school in 1973, Bill scored 1590 out of 1600 in the college SAT test, which was very high. Later he enrolled himself in Harvard University in the fall, to pursue his career in law. As his passion lied in computers, Bill spend most of his time in the computer lab than in the class. Gates remained in contact with Paul, who dropped out from Washington State University and moved to Boston to work in Honeywell. In summer, 1974 Gates dropped out from Harvard to join Allen at Honeywell. In 1989 Bill eventually met Melinda French a 28-year-old Microsoft executive, Bill was then 37. Meanwhile their relation became strong and intimate and they discovered each other and Bill came to a decision that Melinda was a perfect match for him. On January 1, 1994, Melinda and Bill were married in Hawaii. Gates was devastated by his mother’s death in 1994, with breast cancer. In 1996, Bill and Melinda had their first baby girl, Jennifer. A year later, Gates moved his family into a 55,000 sq ft. $54 million house on the shore of Lake Washington, where he lives with his wife and three children. Bill is interested in reading books, playing golf and bridge. He authored and co-authored many books. In 1999, He wrote Business @ the Speed of Thought, a book that shows how computer technology can solve business problems in fundamentally new ways. The book was published in 25 languages and is available in more than 60 countries. Business @ the Speed of Thought was listed on the best-seller lists of the New York Times, USA Today, the Wall Street Journal and Amazon.com. His previous book, The Road Ahead, published in 1995, held the No. 1 spot on the New York Times' bestseller list for seven weeks. He has donated the proceeds of both books to non-profit organizations that support the use of technology in education and skills development. Bill gates states that, “Paper is no longer a big part of my day. I get 90% of my news online, and when I go to a meeting and want to jot things down, I bring my Tablet PC. It's fully synchronized with my office machine so I have all the files I need”. His enormous efforts to bring out agile operating systems, to give a new definition to digital revolution, and his philanthropic works were recognized throughout the world and he was honored with numerous awards. However much he is honored, it is unmatched to the great achievements he made. 20th century, as well as one of the 100 most influential people of 2004, 2005, and 2006.
as the 2005 Year for their humanitarian efforts. Gates ranked number one in the "Top 50 Cyber Elite" by Time in 1998.
and improving health in the developing countries of the world. Bill Gates may walk out the door from Microsoft, but he leaves a lasting impression. These are four of his core beliefs that are likely to carry on at the company he founded. Think of software as a utopian tool. "Thirty-three years ago the company was founded on the proposition that software would be important," says Gates. "Looking at the next decade, the value that will be created by software and popular software platforms will be greater than ever." Think of software as a utopian tool. "Thirty-three years ago the company was founded on the proposition that software would be important," says Gates. "Looking at the next decade, the value that will be created by software and popular software platforms will be greater than ever." Gates takes what colleagues call a utopian view of software. He believes it can do anything. That means the revolution is just beginning. Says longtime Microsoft executive Craig Mundie: "Today Microsoft actually thinks about itself as just a software company - not a specific type of Software Company, not a PC software company, not a word-processor software company. And that has been many years in coming." Let the engineers rule. Microsoft employs about 30,000 programmers among its 90,000 people. In operating groups, engineers are involved in every major decision. Not only that, engineers typically get paid more than business people. The geeks also get many toys: Microsoft's $8 billion computer science R&D lab is the world’s largest. At a recent executive retreat, Gates said he thought every great business person at Microsoft should cultivate at least five close relationships with engineers. Institutionalize paranoia. "It's very Microsoft to prepare for the worst," says Gates. His heirs agree, and they want to keep it that way. The collective worry a few years ago was that Linux and open-source software could wipe out Microsoft. Today there are products across the company that takes for granted that customers will use open source products alongside Microsoft's own. Meanwhile, Windows Server is finally gaining market share against Linux. Fear is what enabled the company to make that necessary transition. "Bill and Steve created what I guess I'd characterize as a culture of crisis," says chief software architect Ray Ozzie. "There's always someone who's going to take the company down. It's mythical, but at any given point in time there might be two or three big competitive things that the company is juggling. It's something people here are used to, and it's accretive in terms of making things more resilient over time." Invest for the long term. One of Microsoft's most successful products at the moment are Share Point, a set of tools to enable companies to build both internal and external websites - everything from collaboration and blogs to a flagship dot-com. This year it will generate about $1 billion in revenue. But that product has been evolving for a decade.” Whatever the cycle is, we will keep investing through the cycle,", "because we know on the other side whatever cycle happens, there is opportunity. That's just the way the company thinks about itself." Before retiring in July 2008, Bill Gates gave the following advices to high school students. You can get good learning experience to enhance yourself and get motivated from these valuable advices. “Life is not fair - get used to it.” The world is never fair. You know this. You can never change the whole world. Injustice still exists in the current society, so you should try to adapt. “The world won't care about your self-esteem”. The world will expect you to accomplish something before you feel good about yourself. Your extreme self-esteem may make your job inconvenient. Don't attach too much significance on your self-esteem as people care about your achievements rather than it. “You will NOT make 40 thousand dollars a year right out of high school. You won't be a vice president with car phone, until you earn both.” Normally you can't be rich if you have just finished high school. However to become an executive, you need to obtain both: a high school certificate and the money. “If you think your teacher is tough, wait till you get a boss. He doesn't have tenure.” Don’t complain that your boss is tough. When you are at school, your teachers always stand by you whenever you meet problems. However if you have thought that all your problems really come from the hard requirements of your teachers, you shouldn't look for a job. Simply if there aren't strict demands from your company, you will do nothing and quickly become unemployed. Then nobody will give you a hand. “If you mess up, it's not your parents' fault, so don't whine about your mistakes, learn from them.” Don't blame your failure on your destiny. All you need now is to stay calm and start from scratch. You should show your gratefulness to your parents for spending most of their lives for your living and growth. All the “outdated” of your parents today is the price they have to pay for your growth. Keep in mind that you can always become a leader, so that you will have more motivation to strive for your career. Don’t always wait for holidays or you will be left behind your colleagues. That backwardness means elimination and unemployment. Everybody likes watching TV, but you shouldn't watch it too much. As that actually isn't your life and your thinking will be influenced. You yourself have to determine your own life. You should be nice to everyone. Life has happenings you could never expect. Be open to your boss; don’t say bad things behind his back as it will bring you nowhere. After more than three decades of entrepreneurship, Bill provided a great sense of achievement for himself and revolutionized the rest of the computer industry. Out of his experiences, he shares key lessons to guide us all through. “Every business and household must have a computer and must run Microsoft software”, was the basic guiding vision of Bill Gates. When people in the world were not even aware of the software industry’s future, when people were unaware of the unknown, here was a man who had full confidence on his gut feel, and had the passion and zeal to take the vision the farthest possible way. He was almost there achieving his vision. This clear vision of him won him success and glory and made him the richest person in the world for 13 continuous long years. Bill Gates says “Your most unhappy customers are your greatest source of learning.” This says that Bill Gates was never afraid of losing and went on to win a lot of deals because of this. While the Microsoft windows operating system is the widely used in the world, there are a good number of criticisms and unhappiness about the software among the users. While many of them used to get bugged using Microsoft products, Bill Gates did not easily give up. He took all those as nice lesson and is improving every single day. When you start achieving something big, there will be people who would want to make fun of your efforts, criticize and try to pull you down. The stronger you stand the bolder you get the faster these negatives fade. Bill Gates took up the accountability of being the Chief Software Architect; Bill Gates was nurturing Microsoft by building a wide spectrum of products. This was not just to capitalize on the knowledge but also to provide the best by understanding the requirement of the people. He did not wait for people to ask what they wanted and instead made a revolution of creating an opportunity for himself and his company by innovating. He did not sit and do something that anyone could, but he took the reins into his hands to take Microsoft to these great heights. This is one never mentioned secret of success. Action is the key word, when logic never drives us its emotions. We must have that emotional strength in us to act, to perform. Bill Gates as a small young boy never had anything to lose which he kept telling his good friend Paul Allen. When he had several odds against him such as the American Law and several cases against him, he still without fail took action by developing more software, which the people wanted. This made him a super star overnight. If not for Bill Gates, Microsoft would have not seen the light today of what it gets. This was because of his persistence and constant delivery of ideas to his Goals and vision. He was a drop out from one of the world’s best universities the Harvard and not everyone from there went to achieve great heights like Bill Gates did, which reiterates the basic fact that education is just a tool for success and does not define success itself. During the convocation address at the Harvard university, Bill Gates mentioned that good he came when they were graduating and not when during the time when they joined the university else they would have changed their mind. Right from day 1 at Microsoft, Bill Gates was very open to the ideas. This he also proved later when Steve Balmer stepped into the shoes of Bill Gates and became the CEO of the company. He always believed that there is no end to learning from people, from books and so on. “I really had a lot of dreams when I was a kid, and I think a great deal of that grew out of the fact that I had a chance to read a lot”, says Bill Gates. Ready for more ideas to float around which will make sure that the same culture of innovation continues in Microsoft even without his presence. This is by far the best lesson what we learn from Bill Gates. At a tender age of 21, Bill Gates had achieved many a things beyond money and fame. This did not allow him to stop achieving and always had the drive to achieve great heights. “If I’d had some set idea of a finish line, don’t you think I would have crossed it years ago?” quote Bill Gates with utmost passion and determination. Never stop learning was the Mantra of Bill Gates which he follows until date. This makes him a Great Leader of our times. He will always be remembered as an icon and even without his presence in Microsoft; he would still be regarded as a great inventor and a real genius with respect to Business, Technology and Entrepreneurship.